Clare Balding's ancestry is a colourful mix of royalty, the aristocracy and ordinary people who climbed up the social ladder to join top society. Through her mother's family, Clare descends from the Earls of Derby – one of whom, the 12th Earl (1752-1834) founded both the Derby and that other Epsom classic, the Oaks – and also from the Earls of Huntingdon. Through the latter, she is a direct descendant of William the Conqueror and seven other medieval monarchs, Henrys I, II and III, King John and Edwards I, II and III. Her family tree is also home to some ancestors who met with tragic ends. Her 14th great-grandfather was George Plantagenet, Duke of Clarence (1449-1478) who, according to Shakespeare, was famously drowned in a barrel of Malmsey wine, and her 13th great-grandmother was Clarence's daughter, Margaret Countess of Salisbury, the last of the Plantagenets and a Catholic martyr who was messily beheaded as a frail old lady of 67 on the orders of Henry VIII in 1541. I was intrigued to discover that Clare is in fact one quarter American. She descends from a prominent US family, whose ancestry has been traced back to a Dutch immigrant into New York in 1634. A great-great-great-grandfather was a baking powder tycoon, while her paternal English ancestors were involved with horses as far back as I was able to discover. A 4x great-grandfather was a saddler in Reading in the 19th century and successive generations of his descendants were horse dealers and trainers. Clare Victoria Balding was born on 29 January 1971, the daughter of Ian Anthony Balding and the Hon Emma Alice Mary Hastings-Bass, whose father Peter Hastings-Bass (1920-1964) trained race horses at Kingsclere, Berkshire, near Highclere Castle where Downton Abbey was filmed. The stables were subsequently taken over first by Ian Balding and then by his son, Andrew, Clare's younger brother. Clare went to Downe School, near Newbury, where she was head girl and a contemporary of the comedian and actor, Miranda Hart, whose ancestry I've also delved into. Ian Balding and Emma Hastings-Bass married at Kingsclere in 1969. Ian Balding is half-American, having been born in the USA on 7 November 1938. His parents were Gerald Matthews Balding and Eleanor S. Hoagland, who married in New York on 14 December 1935. The marriage attracted a write-up in the New York Times because Gerald Balding, along with his brothers Ivor and Barney, was a well-known English polo player in the US in the 1930s, while Clare's grandmother, Eleanor Hoagland, was a society heiress from a wealthy family. Eleanor's great-grandfather, Joseph Christoffel Hoagland (1841-1899), founded the Royal Baking Powder Company, once the largest manufacturers of baking powder in America. The Hoaglands descended from a Dutch immigrant, Christoffel Hoaglandt, who entered what was then New Amsterdam (later New York) in 1634 and died in 1684. The Hoaglands had homes in Brooklyn, New York, and on Shelter Island, a fashionable summer resort at the tip of Long Island. 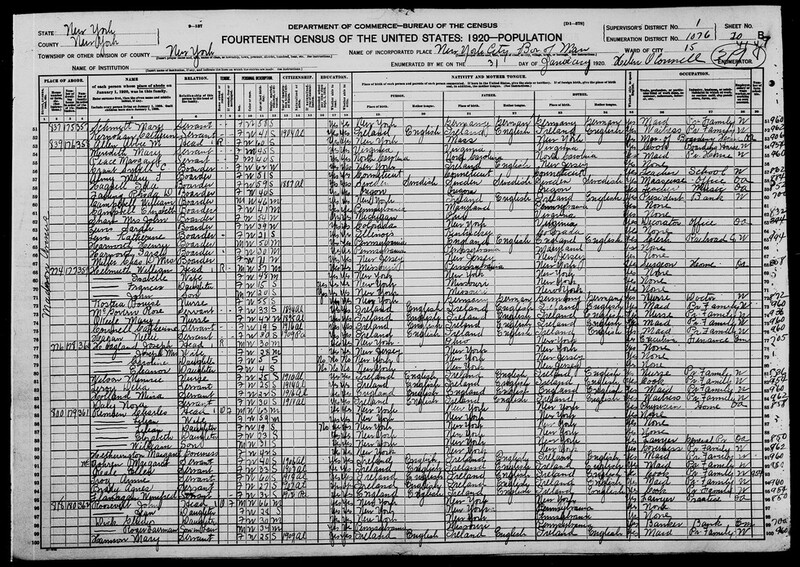 In the United States census collection I found an entry for Clare's grandmother, Eleanor Hoagland, who was born in New York in 1915. 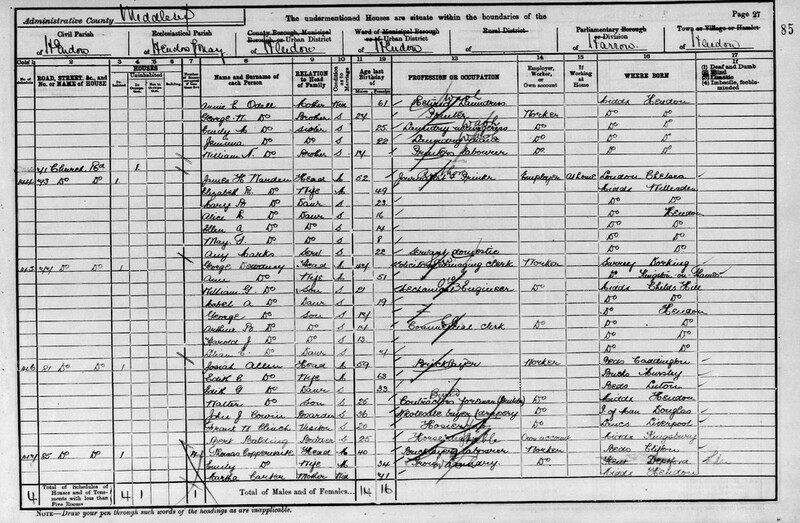 The 1920 census of New York City shows her aged four living with her parents, Joseph Hoagland, aged 30, and Mrs Joseph Hoagland, 28, and her sister Caroline, aged five. Joseph Hoagland's occupation was given as a finance executive and he was born in New York, while his wife was born in New Jersey. Joseph was a grandson of the earlier Joseph Hoagland who founded the baking powder empire. There was a nurse and three other female servants in the household, three of them born in Ireland and one in England. Returning to the Balding line, Gerald Matthews Balding (1903-1957), was the son of Albert Charles Balding and Florence Mabel Matthews, who were married at Hendon, Middlesex, in 1901. In the 1911 census Albert and Florence Balding were living at The Hall, Keyham, Leicestershire, about seven miles east of Leicester. Albert was 34, a horse dealer, born at New Cross, London, his wife Florence was 31, born at Hendon. The couple had been married 10 years and had had five children, one of whom had died. With them were three of their four sons, John Barnard Balding (4) Ivor Godfrey Balding (2) and Humphrey Quinton Balding (1), all born at East Langton, Leicestershire, and two female servants. However, the eldest son Gerald – Clare Balding's grandfather – was a pupil and boarder, aged 7, at a convent school run by French nuns at Leicester Road, Market Harborough. He also was born at East Langton. A decade earlier in 1901, Albert Balding was not yet married and he appears as a boarder at 81 Church Road, Hendon, in the household of a family called Allen. 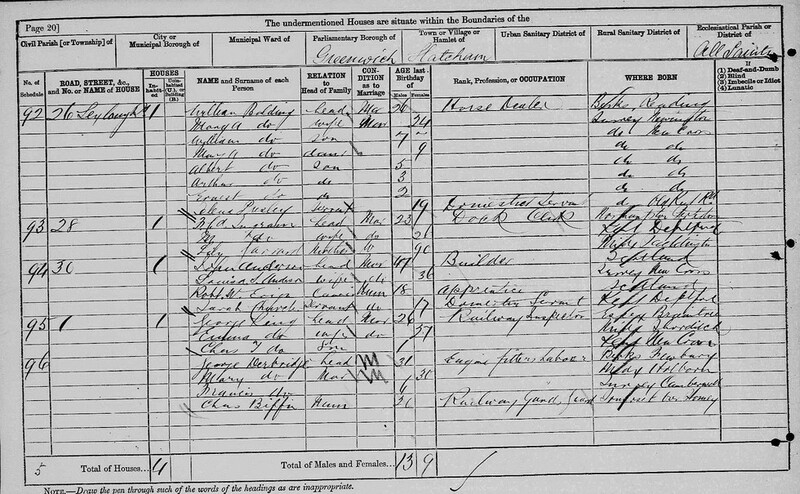 Albert appears in this census as Bert Balding, aged 25, a horse dealer, and his birth place is shown as Kingsbury, Middlesex. The place of birth didn't fit for that given by Albert himself in 1911, which was New Cross, or for his entry in the GRO birth indexes, which records his birth as having been registered in the first quarter of 1876 at the Greenwich registration district. However, the information in 1901 was probably given by the head of the household, Josiah Allen, a bricklayer, who either got it wrong or was given incorrect information by Albert himself. Albert Charles Balding and Florence Mabel Matthews were married on 22 August 1901 at Hendon Parish Church. Albert's occupation was given as a dealer in horses and his father was William Balding, deceased, also a dealer in horses. Florence's father was John Barnard Matthews, also deceased, a licensed victualler. 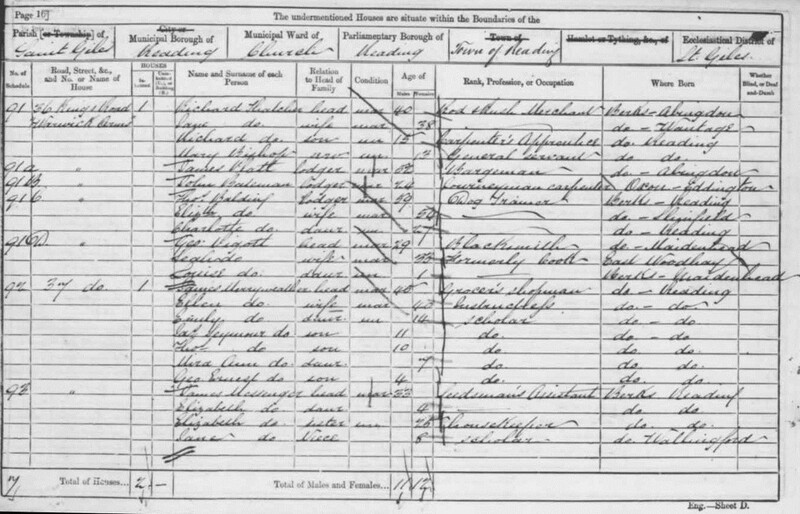 Attempting to discover who Albert's parents were, I next looked at the 1891 census. This produced more confusion because initially I couldn't find him! I did eventually locate him – but his first name appeared on the census schedule as HERBERT. He was living with his grandparents, William and Mary Ann Balding, at an address called Willesden Paddocks, Oxgate Lane, Willesden, north London. William Balding was aged 60, a dealer in horses, born at Reading, Berkshire; Mary Ann Balding was 59, born at Wickford, Essex; and with them were three grandsons, William (16), Herbert/Albert (15 )and Arthur (13). All three boys were born at New Cross, Middlesex, and the two elder ones were described as 'Assistant to Grand Father'. It was apparent William Balding's horse dealership was going well, for also in the household were a female servant and six males all connected with horses or farm work, including three grooms, a cowman, a blacksmith and a stableman. In the 1881 census Albert was aged five and living with his parents at 26 Leylang Road, St Paul Deptford, in south London. This area was part of the Haberdashers estate developed by the Haberdashers' Company around New Cross Gate in the second half of the 19th century. William Balding was 26 and a horse dealer, born at Reading; his wife Mary A Balding was 24, born at Newington, Surrey; and they had five children, Mary A 9, William 7, Albert 5, Arthur 3 and Ernest 2, all born at New Cross. GRO indexes revealed that William Balding jr died in the last quarter of 1881, aged only 27, and that his widow Mary Ann remarried at Newington in 1887. This would explain why Albert and his brothers were living with their grandparents in 1891. William jr and Mary Ann Burn had married at Trinity Church, Newington, in 1872, William's father being also William Balding, horse dealer, and Mary Ann's father being Henry Burn, a green grocer. Both told a fib on the marriage certicate, saying they were of full age, whereas their ages in the 1861 census showed that the couple were only about 17 or 18 when they wed. In the 1871 census William Balding the younger was living at 1 Westbourne Terrace, Bird In Bush Road, Camberwell, Surrey. William was a horse dealer's assistant, born at Reading. Head of the household was William Balding, 38, also born at Reading and a master horse dealer employing two men and a boy. There was a peculiar error on this schedule since William sr's wife's name was given as Moneghan Balding, also 38, born at Wickford, Essex. Searching GRO indexes and other censuses failed to find anyone of the forename Moneghan, and I must assume it was a mishearing or mistranscription of Mary Ann, as found in the censuses of 1881 and 1891. Perhaps the enumerator was slightly deaf! 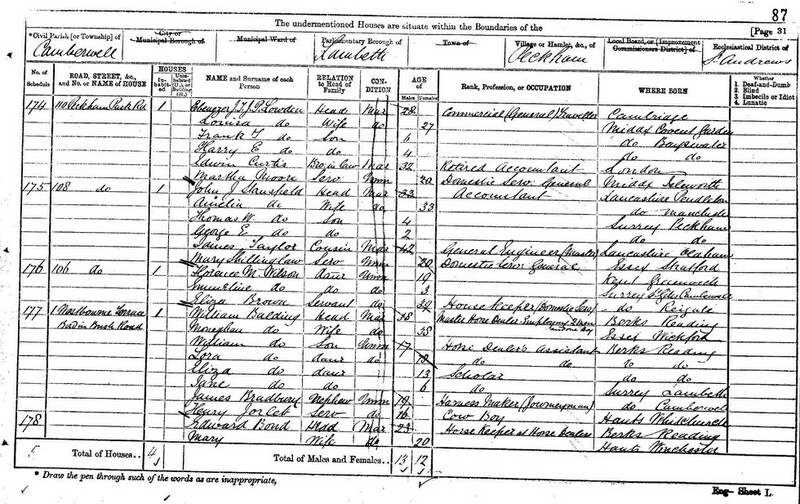 Also in the household in 1871, besides William jr, were three daughters, Lora (18), Eliza (13) and Jane (6). The two eldest girls were, like William, born at Reading and the youngest at Lambeth. In the 1861 census I found William Balding sr and his son at 16 Swan Street, Newington, Surrey, with both named only as W. Balding. William sr was shown as 28 and a general dealer, born at Reading. However, his wife was shown as Eliza Balding, also 28, born at Reading also – thus, the Mary Ann Balding who was shown in later censuses as the wife of William sr could not have been William Balding jr's mother. The family tree was getting more complicated. The GRO marriage indexes have a potential marriage for William Balding and Eliza Parsons at Wallingford, Berkshire, in the last quarter of 1852 and this may have been the right couple. Despite searching, I was unable to find a death for Eliza after the 1861 census, but William Balding sr remarried at St Barnabas Church, South Kensington, in February 1876 to Mary Ann Bartlett, a spinster. William described himself as a widower and gave his occupation as Job Master, another role connected with horses. His father was given as Thomas Balding, a saddler. So what happened to Eliza? Did she die or was there a divorce, which was difficult to obtain for most ordinary people in those days? I didn't find one. My pursuit of Clare's ancestry was taking me away from London and to the town of Reading. I followed her great x5 grandfather Thomas Balding, who was born about 1800-1802, through several censuses until his death in the Greenwich registration district in 1882, his age being given as 82. In the 1861 census Thomas was a lodger, with his wife Elizabeth, at Kings Road, St Giles, Reading. He was 58 and described himself as a dog trainer – was he perhaps training greyhounds? His birth place was given as Reading and that of his wife, Elizabeth, 54, as Shinfield, a village just south of Reading. There was also an unmarried daughter Charlotte, 27, born at Reading. I was unable to trace a birth or baptism for Thomas Balding, but if my research is correct, then the connection of Clare Balding's paternal ancestors with horses goes back at least a couple of centuries to her 4-times great-grandfather Thomas, the saddler in Reading. She is carrying on a long and illustrious 'horsey history', as you might say! 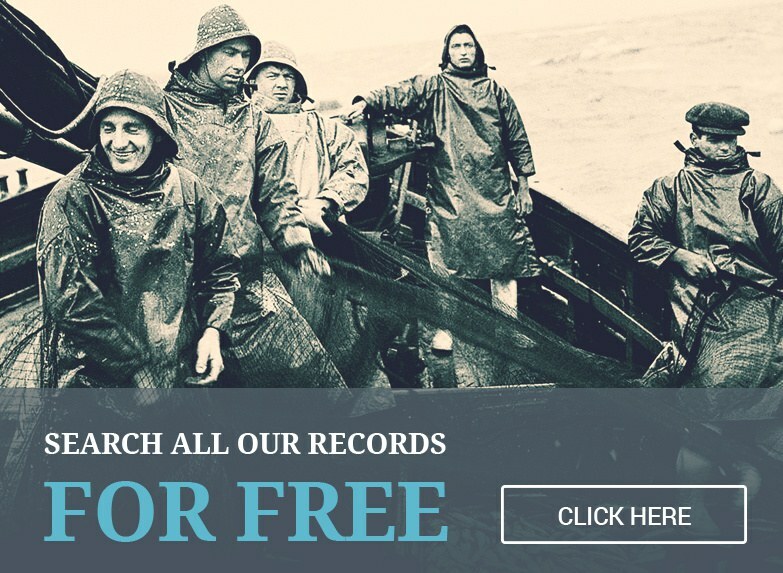 Roy Stockdill has been a family historian for over 40 years. A former national newspaper journalist, he edited the Journal of One-Name Studies (for the Guild of One-Name Studies) for 10 years. Roy is on the Board of Trustees of the Society of Genealogists. TAGS clare balding celebrity aristocracy american history who do you think you are?